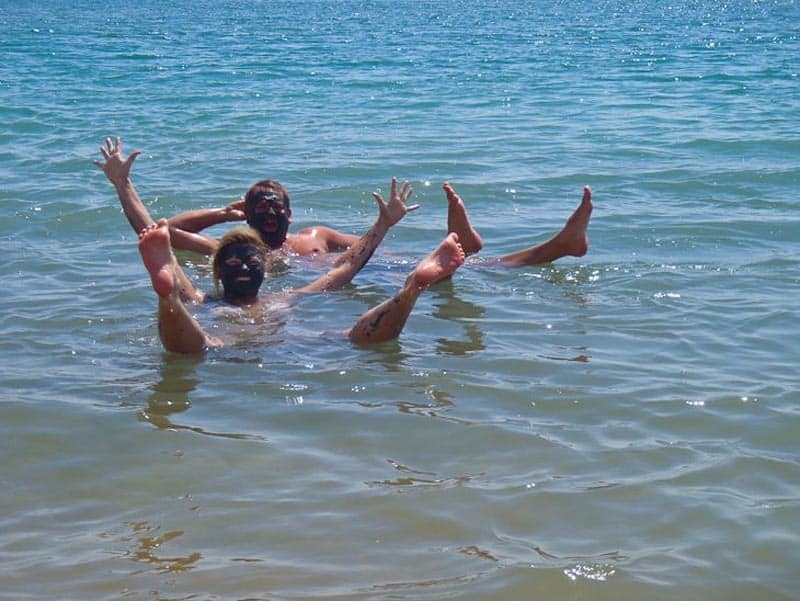 “I can't float.” That's the first thing dave said when entered the Dead Sea in Jordan. It's a fact and I am envious of Dave because he can always lay back in a pool, relax and enjoy floating on the top of the water with very little effort. Unless I constantly tread water, wave my hands or kick my feet, I cannot float. The minute I stop moving, I sink. So it was very exciting when we went to the Dead Sea in Jordan. This is a place where anyone can float and I was determined to put this rumour to the test. 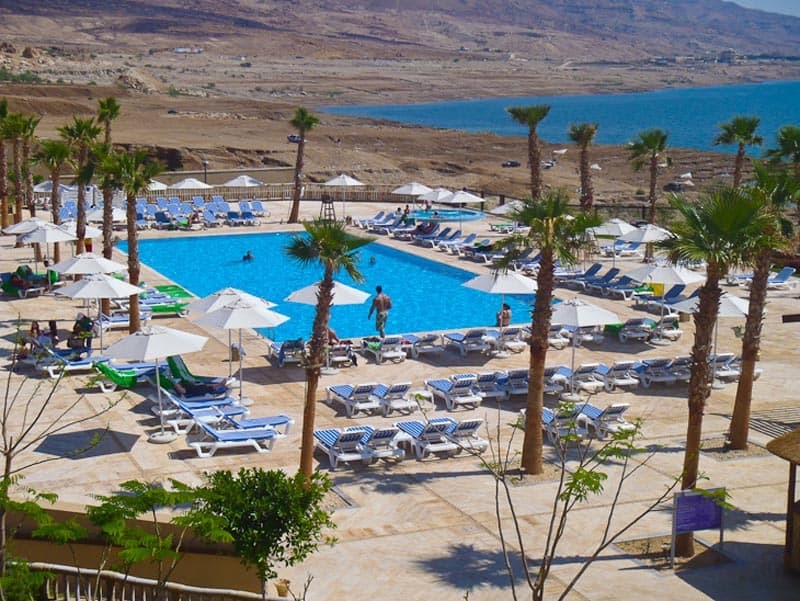 We arrived at the Holiday Inn Resort located directly on the Jordan side of Dead Sea. I know what your thinking, Holiday Inn Resort? While we did have our fair share of problems with two other 5 star hotels in Jordan this was one of the better ones we stayed at outside of Amman. It isn't your typical Holiday Inn, it is more upscale than the ones we normally frequent during our road trips to Florida and hey, we were here for the Dead Sea, not the hotel. The only problem was how generic this hotel is. It could be located anywhere in the world. Sure it is nice and has all the amenities, but if I am staying in the Middle East, I want to feel like I am in the Middle East. After checking into our room, we made our way down to the beach to see what all the fuss is about at this lowest point on earth. 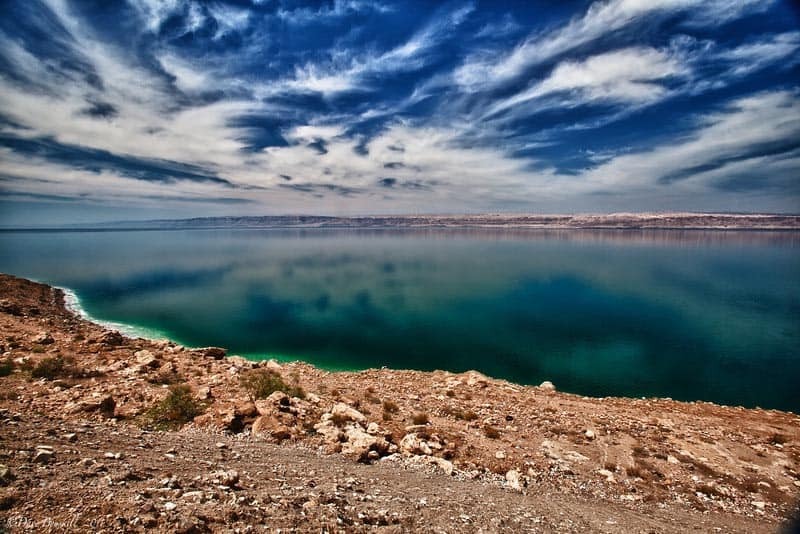 At 423 meters below sea level, the banks of the Dead Sea of Jordan are indeed the lowest point on earth. The Dead Sea has a salt level of a whopping 33%. To give you an idea of the saline levels, the ocean has a salt concentration of only 3.8%. And that my friends is exactly why we humans have such an easy time floating in the Dead Sea. The Dead Sea isn't exactly a massive expanse. It is only 67km long and 18 km wide at it's widest point. However it is deep. 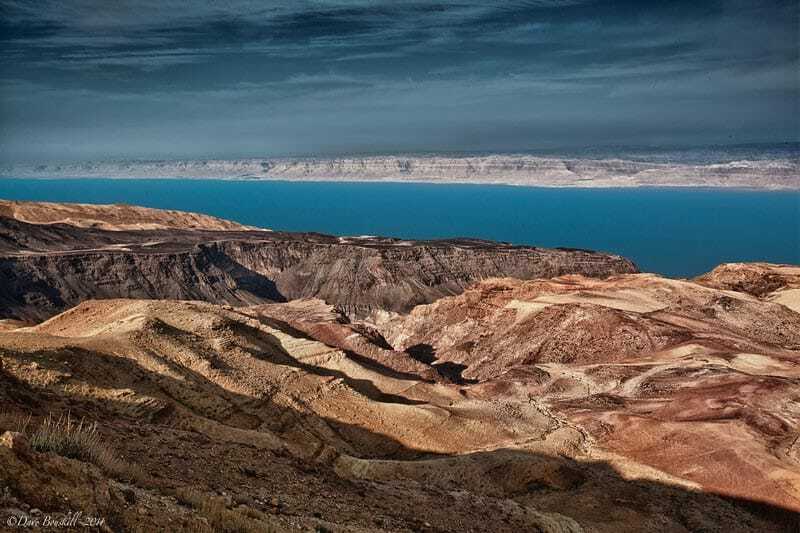 At 77 m ( or 1,237 ft) deep, the Dead Sea is the deepest ultra salty lake in the world. Where we were located it is only about 7km wide giving us a clear view of Israel across the pond. At night the lights of Jericho flickered from a land so close to us and yet so far away for many Jordanians. We love being full blown tourists and instead of heading for the water, we made a detour for the mud. 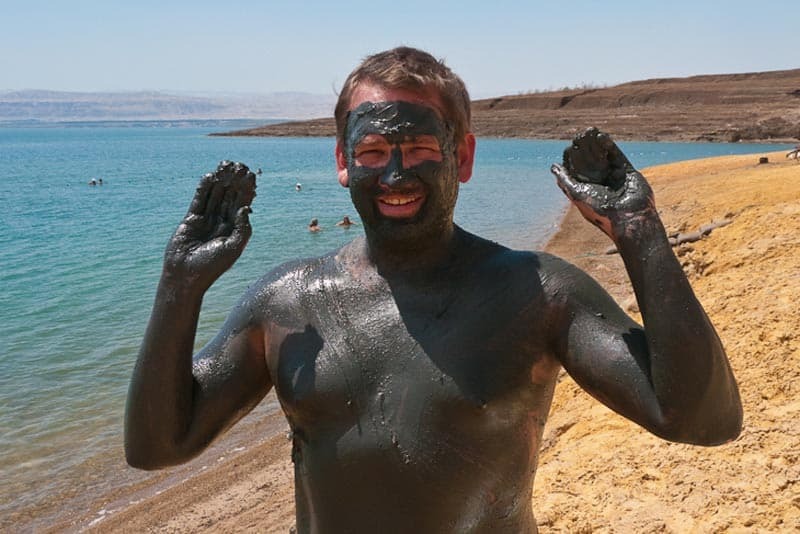 You can't visit the Dead Sea without slathering your entire body with the black goo. It just wouldn't be right! 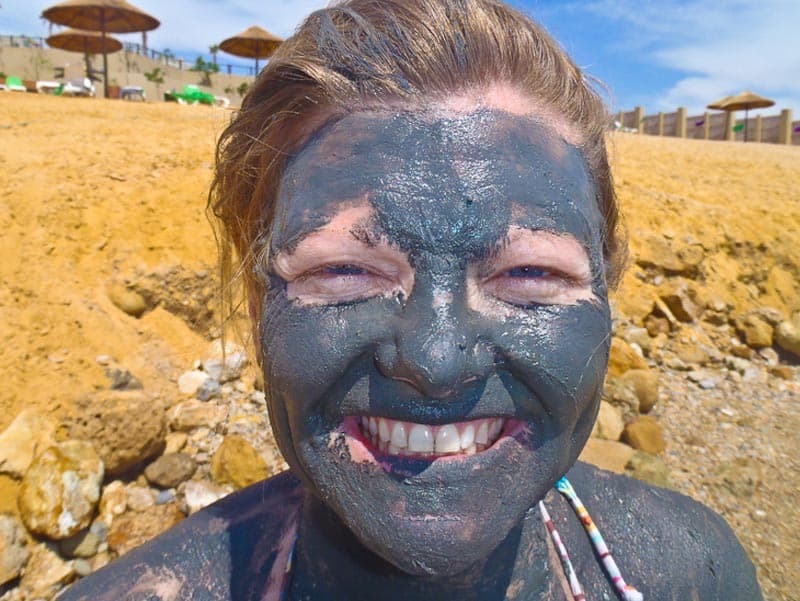 The medicinal mud from its shores have a healing power that people swear by and after you have washed yourself off, your skin will feel just like a baby's bottom. People actually come to the Dead Sea for a month at a time to take advantage of its healing benefits. We just wanted to look good for the photograph! 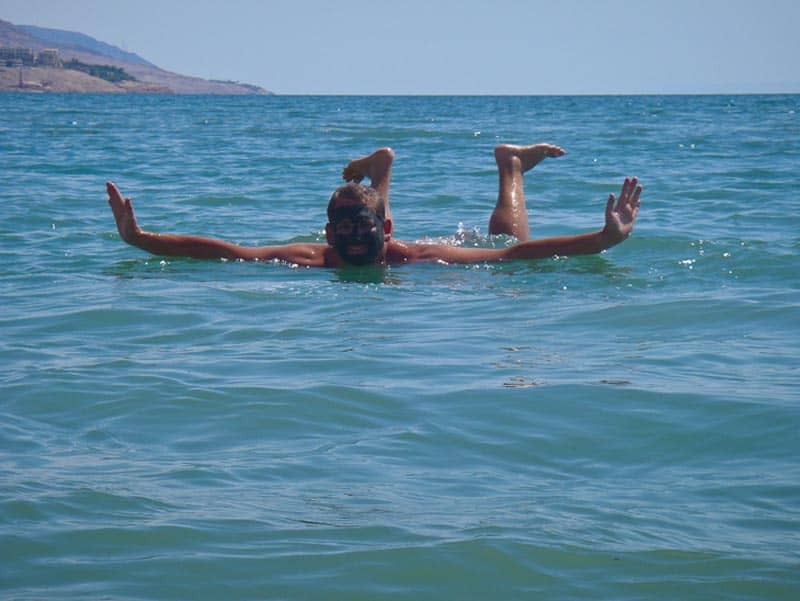 You Really do Float in the Dead Sea!
. It was warm and didn't feel too different from any other body of water I had walked into, but I was a little worried about what the salt concentration would do to the camera. Dave told me to relax and enjoy the experience. I dutifully listened. The minute I laid back into the water, I could not believe the feeling. I actually felt like I had water wings on my legs and shoulders allowing me to float with ease in the thick waters of the Dead Sea. Dave could still float higher and easier than me, but I didn't care, I was floating! Dave kicked himself for not bringing a newspaper down so that we could grab that ultra cheesy tourist shot of us reading the newspaper in the water. But no matter, we still managed to be quite cheesy when it came to grabbing snapshots. We played around in the good old Dead Sea for quite a while until it began to sting my skin. Dave lasted 15 minutes longer than me. I enjoyed a shower on the beach and a lounge under a sun umbrella while he took advantage of every minute in the water. This could be the only time in our lives that we could experience such a phenomenon and he was taking advantage of every second. 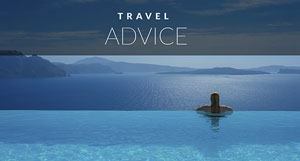 The salt of the Dead Sea is strong and you must be careful not to submerge your face into the water. It will sting your eyes something fierce. If you have a cut of any kind, you will definitely feel it and will not last very long in this second most densely salted body of water in the world. After our fun and frolicking, we hit the pool of the hotel for a little bit of pampering. We laid back on the lounge chairs of the “adult only pool” and took in the views of the infinity pools, the muli-level pool, the wading pool and our pool. This Holiday Inn definitely has it's fair share of pools. We even found a quiet kiddy pool near our hotel room complete with canopy to shade the little tykes from the harmful UV rays of the sun. It was pretty cool being at the Dead Sea. Not only is it an awesome break in your Jordan Adventure to spend a day or two by the sea, it is a major historical destination. It was a refuge for King David, a health resort for Herod the Great and it was used in the mummification process for the ancient Egyptians. This sea has definitely seen it's share of history. We ended our night having dinner at the Movenpick Hotel. Their friendly PR contact came out to greet us, took us on a tour of the hotel and treated us to a delicious meal of anything we would like. We stayed all day at the Holiday Inn and didn't hear a peep from them. One dinner at the Movenpick and we felt like we could stay the week and never tire of the atmosphere. They had fabulous entertainment going on right in front of our table and we would have loved to have joined the crowd in trying a Sheesha while watching the Belly Dancer perform. This place was beautiful and exactly what we would have wanted. It felt like a little piece of the Middle East, smack dab in the middle of the Middle East. 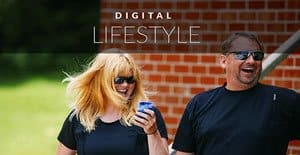 40 Responses to "Dead Sea Fun in Jordan – Floating Baths and Healing Water"
Really amazing photos. I’m heading to Jordan soon and can’t wait to visit dead sea. However, our trip planning has reached no where as we are unsure if it’s a good idea to do the Wadi Mujib trek (2/4 hrs) before or after visiting dead sea. We are afraid we will get injured in the mujib & the water in dead sea will sting. Any thoughts? The Wadi Mujib trek was very safe with guides making sure you slide, jump and abseil in all the right places, you should be fine either way. that said, the Dead Sea does sting, so if you get a cut or scrape, it will hurt so going before your trek is probably the best bet. have a great time! The Jordan side of the Dead Sea is brilliant with the breathtaking ‘Petra’ in its favour. However, the dead Sea is not a place to linger in. In the UK it would be defined as chemical waste and need a licence to transfer it. People are friendly and in Amman you can buy your Sharwarma at the same shop that the King calls in. Buy 2 per person; they’re delicious! 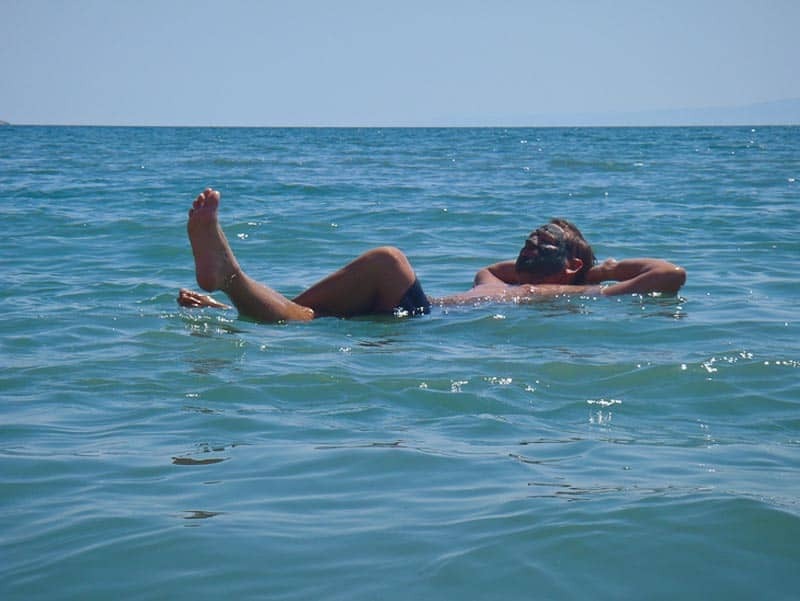 Floating in the Dead Sea in Jordan… another great experience I'll be having soon! Love your muddy face – did it feel like a baby’s bottom after? Haha, it certainly did feel good afterwards, but it stung my skin a little too much during. I have super sensitive skin, Dave fared better than me. WOW- those are AMAZING pictures!!! And I’m glad to see how clear the skies are… that’ my issue about being there in the winter- there is too much smog! Oh- I’m sooo excited to go back!!! 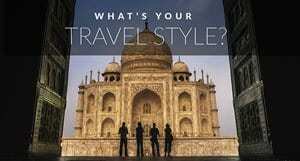 You are amazing with your photos- you should sell them to the tourist office! Hi D&D, I have some wonderful memories of the Dead Sea which I visited from Israeli side. Actually I also worked on a farm there and every evening you could feel the mineral-rich breeze coming from the sea. It was wonderful. PS: The second-to-last picture is really gorgeous! Actually, while doing research, I have read that people drown every year. Not from sinking, but because of trying to swim while being so buoyant. People try to do the breast stroke and front crawl and end up not being able to swim properly because their legs float so much. You are supposed to lay in the Dead Sea, not swim. Who would have thought eh? Very nice pictures. I was swimming there a month ago and was such strange will of all floating. Very cool that you were there just a month ago. The world is shrinking rapidly with the invention of the Internet. It is cool to be able to float like that. That’s funny you have trouble floating, Deb. Usually it’s the guys who have a harder time. Now I want to try out some of that famous mud! I think I have a little in my facial cleanser. This looks so fun, haha I can’t float too. So I would be so happy to come here and test it out too. I always envy at my fiance how he can swim and float. AMAZING photos! 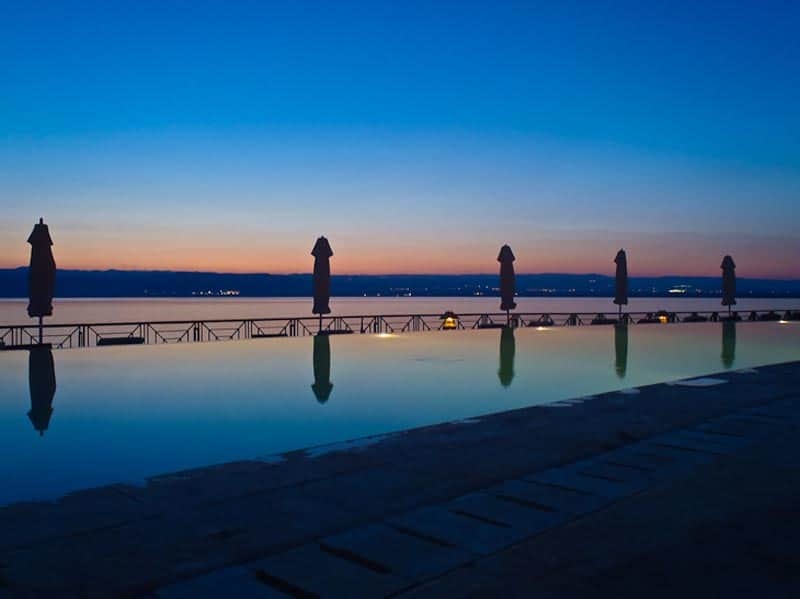 Love your shots of the Dead Sea. I didn’t make it there during my brief trip to Jordan, but I’d love to check it out. What a great post! I remember learning about the Dead Sea when I was in school (around 12 or 13 years old) and being fascinated with it ever since! Sounds like you guys had a lot of fun. I’m glad you got a chance to experience the other hotel but it’s too bad that they treated you better than the one you were staying at! Good post, guys. I remember sitting by the Dead Sea – on the East Bank, looking over to the troubled West Bank – it was at the start of the intifada – so close and yet so far away. And yes, among the chain hotels, the Mövenpick wins every time, esp. in the Middle East. They even manage to make airport hotels (e.g. the one in Bahrain) appealing. This post is both beautiful and very interesting! The pictures are indeed incredible. Love the clouds on the 2nd last picture – great capture Dave! 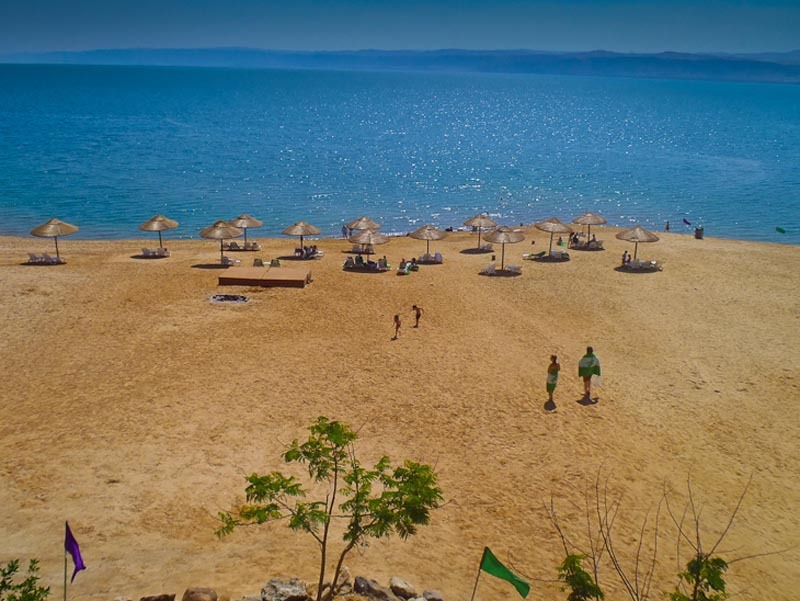 We ended up taking a day trip from Amman and spent a couple hours at Amman Beach, which was really nice also. Glad you guys got the opportunity to experience Jordan – its one of our favourite countries! Good to know about Amman Beach. Did you have to pay to go on the beach, I think that our driver pointed it out to us, it looks really nice. We agree, Jordan is one of our favourite countries too and we don’t say that often about a place. Great pics! Just realised that while the Dead Sea isn’t huge, it’s still larger than the size of my country! And yes, the salt water and mud really does sting awfully after a while – quite a relief to jump into a fresh water pool. My husband can’t float on water either – so I’ve got to now make a return trip with him in tow so that he can enjoy the experience of floating. We live in tiny Singapore! All of 700 sq km. I think you can fit 13 of us in Yellowstone NP. Love the latest post on canyoning in Jordan. We’ve got quite a mean heatwave going on at the mo here, so the waterfalls look awfully refreshing! Hi Yi Lin, the waterfall was very refreshing. We definitely looked forward to getting out of the heat and into the water. Awesome photos!! Like everyone else, this is high on my bucket list. Looks like a blast! It is definitely fun and the weather couldn’t have been better. Great timing on this post, I’m heading there in a few weeks and this really got me looking forward to it even more. Great photos btw, looks like you two had a great time! Glad we could help Catia. Stay tuned for more. We had an amazing adventure right at the Dead Sea canyoning and abseiling. We will be writing about that next week. You have to do it! It was the best experience we’ve had in ages. How much was that part of the trip? The Holiday Inn is very reasonable for a luxury resort. Rooms start at 80JD approx. $119 USD per night. Swimming in the Dead sea is free and you can scoop the mud right out of the shores of the water. Even dining is fairly reasonable with prices for meals around $12. 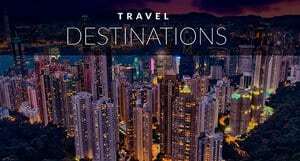 Jordan is a great destination for a 10 day to 2 week vacation. Good to read about the Moevenpick. That would have been my first choice and you confirmed to me that it would be a good one!